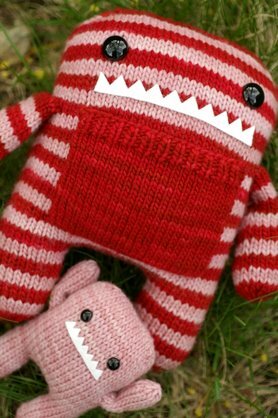 Finished Size: The large monster is 9.5" tall and the small monster is 4.75" tall. 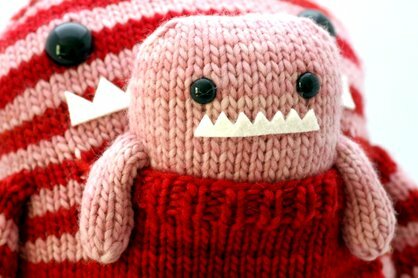 It seems like every spring I get in the mood to knit a Danger Craft toy! It was about this time last year that I knit Maddox for my niece's birthday, and this year I'm sending off Daphne and Delilah to keep him company. These two were actually one of my Ravelympics projects, and you can probably tell by the colors that I had started them on Valentines day. I had them pretty much all finished up when I realized I didn't like how I had placed the pocket on the front of Daphne. I hadn't left enough room for her mouth and it took me until today to gather the willpower needed to take out all the seaming and redo it. Now I know to leave 3 full stripes between the top of the pocket and the bottom of the eyes for the mouth placement. I also found it best to seam on the pocket using mattress stitch which makes it really secure and the edges end up very neat. When knitting Daphne, I used the stationary jogless stripe technique to make the stripes even. It isn't prefect but it does help a lot. I'm still on the hunt for a better way to do jogless stripes so if you have a technique that you use and like please share it with me! 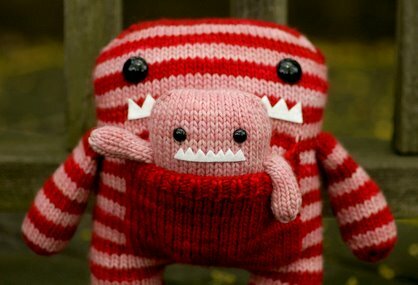 Daphne and Delilah make the perfect pair and I was thinking it would be fun to knit a third one that is even bigger! Modifying the pattern would be pretty easy, and since you can use any weight yarn you'd like, you can size the pattern up or down just by changing gauge. 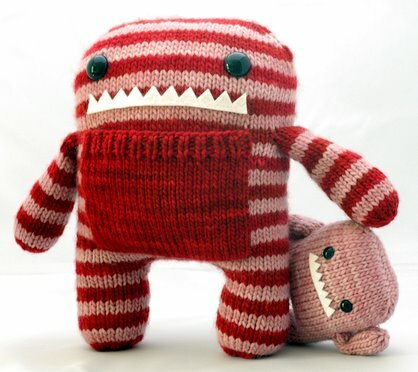 Maybe I could use Malabrigo Chunky or Worsted held double (or maybe even triple) to create a supersized monster that would be able to hold both Daphne and Delilah! 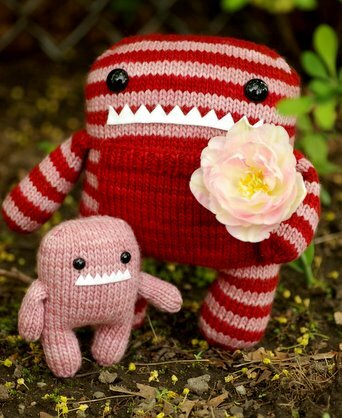 Rebecca has so many cute patterns to choose from it's almost impossible to decide which one to knit next. She is now even offering kits with an exclusive pattern and Lorna's Laces yarn in her Etsy shop. You should also check out Rebecca's newest pattern, Zeke the Aloof Alpaca!